We are home from school today. Our heads are really hot. And our bodies too. Dr A says no school tomorrow either, so I'll miss my field trip. I don't like that! Get better soon. I don't like the sad faces. So sorry your girls are sick! 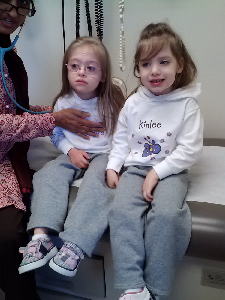 I hope they feel better soon! Would you mind sharing what type of glasses Braska is wearing? They are super cute! Eliana just recently found out she needed glasses and its been hard to find much choice in something that fits her.